As traveling becomes more and more common it is very important that the modern man carries his belongings in the best way possible. As most people who travel have a tight schedule, it’s key to have your things organized and carried in the right way. In this guide, we are going to discuss luggage in all its forms. These days, what’s great about luggage is that it can be very versatile. We are not sending coffers anymore, but our bags can become true closets, specially create for our needs. 1. How do you travel? This bag is the Weekender by QWSTION. 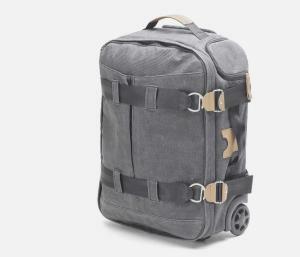 It can be turned into a backpack and contains a 17-inch Neoprene laptop sleeve. It’s very important to establish these things. For example, if you are going camping or to climb a mountain, you are not going to need a suitcase; but a backpack. Also, for those who fly a lot, it’s important to find an item that you are sure will go with the requirements of the airline with which you are flying. You should always take into consideration the possibility of paying a fee for a bag that is too big or too heavy; if the company you are flying with imposes them. Think of whether you will be carrying other bags or not: if you get a duffle bag and you know that you will be also carrying a laptop bag, your hands won’t be as mobile as they would if you had a backpack in which to put your things. Also think of for how long you travel. For example, QWSTION is a brand that offers great bags that were thought to match every need and taste. They have anything from backpacks to totes and duffle bags. They come in different sizes and can be carried in multiple ways. Having such a versatile piece is extremely useful. Some of them are actually made to comply with most airlines’ requirements of hand luggage. They have even received nominations to different awards for their bags. The Organiser by QWSTION can be used for everyday living as well, not just for traveling. 2. Soft or hard-sided? What type of bag do you need? There are two main types of bags: hard-side and soft. Hard-sided bags are made out of fabrics such as polypropylene and polycarbonate. Soft bags are modeled out of fabrics such as leather, microfiber, nylon, polyester or PVC. Soft bags can be expandable and can hold up to 25% more in case you need the space. Soft bags are usually more common than hard-shell luggage. They are a lot easier to squeeze into overhead compartments. Soft bags also absorb shock better. Usually this type of bag can be very versatile and used for many purposes. Hard-sided luggage pieces are usually those in the ultra-lightweight category. These may help you if you are limited to a certain weight for your bag. This type of bag is best for those who usually pack a lot. Also, if you are carrying fragile items, hard-sided bags do a better job at protecting them. Whatever your choice may be, make sure you are buying a quality bag, as a bad one, soft or hard-sided, won’t do the job and you might find yourself in a little trouble. Handles are very important. If they are padded and wide, they are so much more helpful. Some handles retract inside the bag. These are less likely to be damaged in handling. Handles should not wiggle or anything like that, they should be rigidly attached. Handles that are angled for a more natural wrist angle can reduce fatigue in your arms and shoulders. Wheels make your luggage maneuverable and help keeping the damage of the bottom of the case to a minimum. There are two wheeled systems: two- and four-wheeled systems. Four wheeled systems carry the entire bag’s weight, while two-wheelers share it between the handle and the wheels. Even though you will be carrying part of the load, you will have greater stability on uneven surfaces. So, if you are just taking the bag in and out of car, and carrying it through a railway station, a four-wheeler would be better. Four-wheelers that rotate 360 degrees facilitate the transport of the bag. They can also be easily transformed into two-wheelers, by tipping the bag. The 3-Day Travelbag by QWSTION complies to hand luggage requirement of most airlines. Shoulder straps are not only to be found in backpacks, but also in other bags. They are often detachable and should attach at a bag’s reinforced stress points. Strong hardware and reinforced mounting areas are designed to protect the shoulder straps from breaking or tearing off. Gripper pads are designed to keep the straps from sliding off your shoulders. Wider straps are designed to enhance comfort by distributing the load better. This is the “Daypack” by QWSTION. It’s great how it turns into a backpack and can be used for more occasions than just traveling! Corners. Luggage pieces that have corners and feet are better protected. Corners are usually reinforced with vinyl, metal or even leather. Some bags are simpler, while others are more complex in terms of outer and inner pockets and compartments, which we are going to discuss in the next paragraphs. Wet compartments. Some bags, but usually those created for adventure travel have wet pockets incorporated in them or sections that isolate wet garments. You can also use these in case you have a dripping shampoo bottle or something like that. Packing systems. Some bags have so-called packing systems. These can improve organization and reduce bulk. These systems usually consist of mesh and nylon envelopes and cubes of different sizes. Some systems are rigid folding boards designed for wrinkle-free packing. Some bags also have pull-out shelves and organizers that hang in the closet or over a door. Outside pockets. Outside pockets are useful because they allow you to reach items you may need without opening the case. This also results in increased packing options. Gussets. There are a lot of bags that feature an accordion pleat on the sides of a case or sometimes a pocket designed for expandability. Just like clothes, luggage pieces come in both natural and synthetic fibers. Natural fabrics used for luggage pieces are canvas (cotton), leather and sometimes hemp. Synthetic fibers are typically based on nylon or polyethylene, which is made from recycled plastic bottles. Synthetic fibers have a waterproof coating inside and some bags incorporate stain- and water-repellent coatings on the outside too. The thickness of the fiber (also known as the denier), along with the fiber’s material properties and the thickness and type of weave determine the resistance of the piece to abrasion and tears. Ultralightweights usually mix heavy-duty fabrics (used for corners for example) with lightweight ones. Full/Top grain leather is very durable but also expensive. Split leather is less durable but it is also cheaper. Processed leather is leather that has been treated so that it resembles another type. This kind is usually less durable than split leather. Nylon is a synthetic fiber. Its strength is rated in deniers. The higher the denier, the stronger the fiber. We would recommend getting a piece that is of a minimum of 400 denier. The last one is vinyl. This fabric usually resembles leather, it is moderately priced and easy to clean. Even though some might find it weird, it’s probably best to have a bag in a very bright color. It might not match your dark suit, but you will sure spot it from a mile, and so will the people handling it. Look for bags with a detachable piggy back clip or a looped clip near the handle on the top of the bag. These allow you to clip another bag to your main bag and doing this will give you an extra free hand! Always test a bag before you buy it. Walk around with it, carry it a little, push it, press it, etc. Only by doing these things you will be able to tell if the luggage piece fits your needs. P.S. What do you look for when you are buying a travel bag? Which type do you prefer? Share your comments!